Just to be clear, the steering wheel is not exactly the one making a clicking noise when we talk about car problems. However, some drivers manage to hear clicks while turning the steering wheel, leading to a common assumption that the sound directly comes from it. The noise actually comes from a deeper problem – malfunctioning CV joints. Find out how damaged CV joints become the ultimate reason why a steering wheel clicks while turning. First of all, let’s identify the specific functions of CV joints. CV means Constant Velocity. CV joints are composed of ball bearings. One big rubber boot totally covers CV joints from dirt and moisture, as well as to keep the axle grease inside. All ends of a front axle have one mounted CV joint each. The CV joints can also be wrapped together in a cage, which is assembled at the axle shaft’s end. The main purpose of CV joints is to transfer equal control or power from the transmission to the wheels. It does not matter which angle the axle uses when it comes to even power distribution. 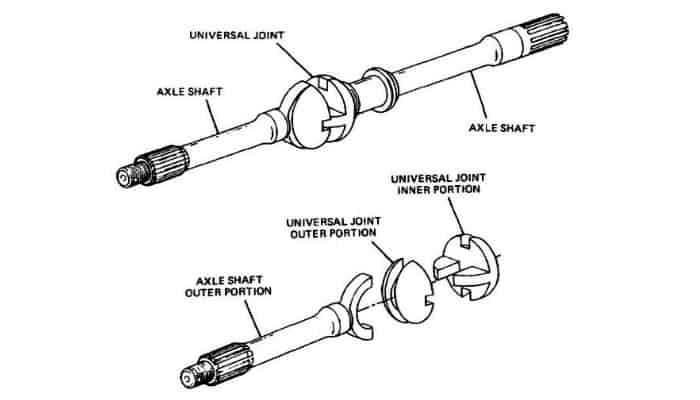 Going further, CV joints promote flexibility in all ends of the axle shaft while the car is moving. They let the axle shaft move through its ends during the vertical movement of the suspension and the turning of the wheels. For an easier understanding, CV joints are just like our wrists and ankles. We need to walk with flexible ankles and use our hands with bendable wrists. Our ankles and wrists follow every movement of our feet and hands. If they get stiff, our actions will be very limited, hindering our daily tasks and increasing the possibility of paralysis. Same goes for CV joints. Without them, the car will not move well because of wheel issues. The CV joints must have the right level of flexibility. Too much and they will get too loose for the car. A damaged rubber boot above the CV joint releases grease. This results to a very loose CV joint which makes the clicking noise. Sharp turns during acceleration make the sound even louder. Adding grease is not the solution. It will never stop the clicking noise for good. What you need to do is replace the CV joint. To temporarily stop the sound, clean the CV joint from debris and replace the grease. Use a car floor jack to lift the vehicle. 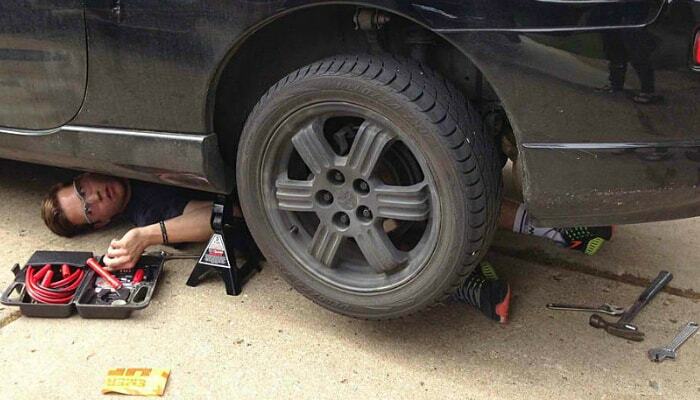 Before going under the vehicle, use sturdy and durable jack stands for your safety. The CV axles are located from the transmission to the center of the tire mount area or hub assembly. The first thing you will see before finding the CV joint is the boot. There are two boots every axle: inner and outer. You will know if there is contamination in the CV joint if the shaft has gooey greenish or bluish grease, as well as some tears or splits. For a temporary fix, clean the CV joints and change the grease. You are probably thinking right now if it is really safe to drive a car with a damaged CV joint. There are actually three scenarios that will test your reliance on a car with a broken CV joint. When the seal of the CV joint is broken, it is still very fixable especially when you are doing DIY work on your car. You do not have to replace the whole CV joint. You can just get a new boot. Just replace the boot as soon as possible though. As long as the damaged boot is not replaced pronto, more grime and dirt enters the joint. Grease also leaks out nonstop. This is the make or break level. Once you hear clicks while the car is making a turn, you can either ignore it or take action immediately. When you ignore it, you can still drive the car for several miles. However, you are exposing the damaged CV joints to more water, debris, dust, and dirt. The clicking noise is actually the reason of not replacing damaged boots at once. When you keep driving the car with a clicking noise, most likely you will forget to replace it. 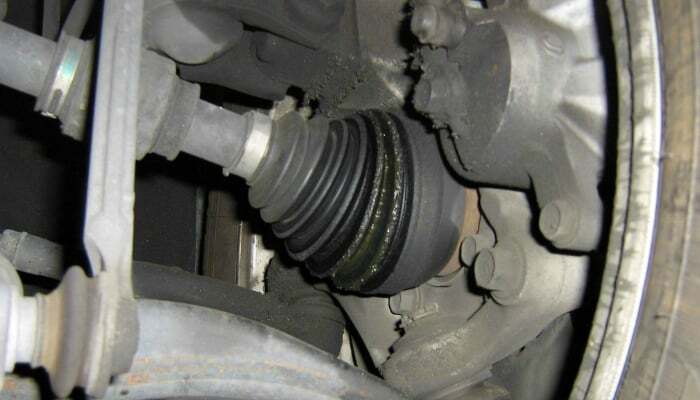 Once the damaged CV joint experiences complete failure, your car suddenly stops moving normally. Why? The axle is already broken. You will find it hard to control the vehicle, leading to a possible horrific accident. To completely prevent damaged CV joints, make sure to change the permanent grease sealed inside when needed. The right time of replacing CV joint grease is when external elements already penetrated it caused by exposure. The main reason behind elements entering the grease is a broken CV joint boot or seal due to human error, sharp debris or heavy use. That’s why it is important to check the CV joints often before it is too late. If you take it for granted and the damage becomes worse, clicking sounds will start whenever you turn the car. Once you see a leak from the CV joint during a regular maintenance check – not because you heard a clicking noise – you are still lucky. You can just simply replace the bands, boots, and grease. The CV joint can still last for additional 100,000 miles. Sometimes, the problem is right under the steering wheel. The column cover can rub against the steering wheel in some instances. 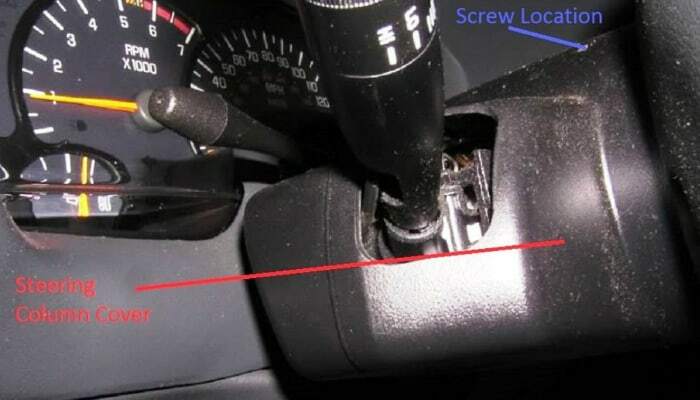 To make sure that it is indeed the reason why a steering wheel clicks when turning, remove it and drive the car. If the sound finally stops, the cover is definitely the root of the problem. The solution for this is way easier than damaged CV joints. Just replace the column cover. Or, you can just trim it down to prevent future rubs. Aside from the clicking noise, too much vibration while driving can be a symptom for a malfunctioning CV joint. The main culprit is the axle. 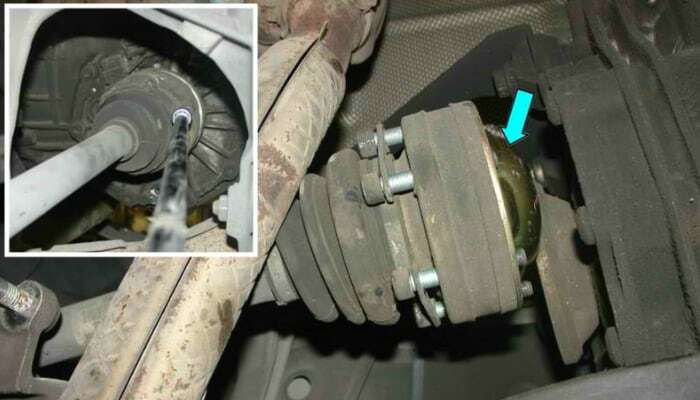 A damaged axle shaft makes itself vibrate harshly because its balance is already affected. During rotation of an unbalanced shaft, the whole car starts to vibrate. The vehicle becomes even more aggressive when it comes to vibrations once it speeds up. Excessive vibration is a hassle for drivers and passengers because of discomfort during the ride. It can also be dangerous, compromising everyone’s safety. Always remember to replace a damaged CV axle before it is too late. Once your car gives symptoms of broken parts, take action at once. The CV joint may just be a small part of the vehicle, but it is very crucial for total wheel movement. Do regular maintenance check around your car to spot a damaged CV joint boot. If you fail to do so, at least replace the CV joint immediately once you hear a clicking noise while turning the car. Do not compromise safety just because your car can still move normally. To know more about other sounds signifying internal vehicle problems, check out why a car squeals when turning.